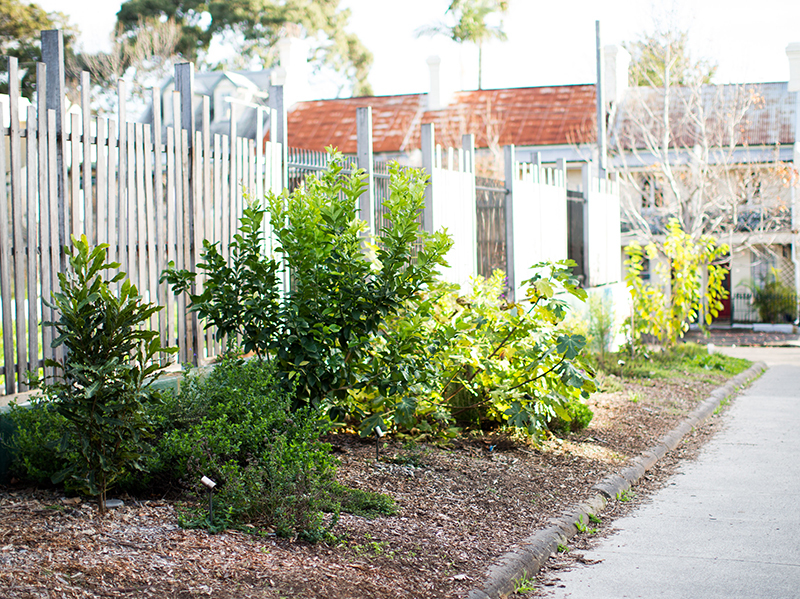 Our first farm is nestled into our local neighbourhood in the inner west. 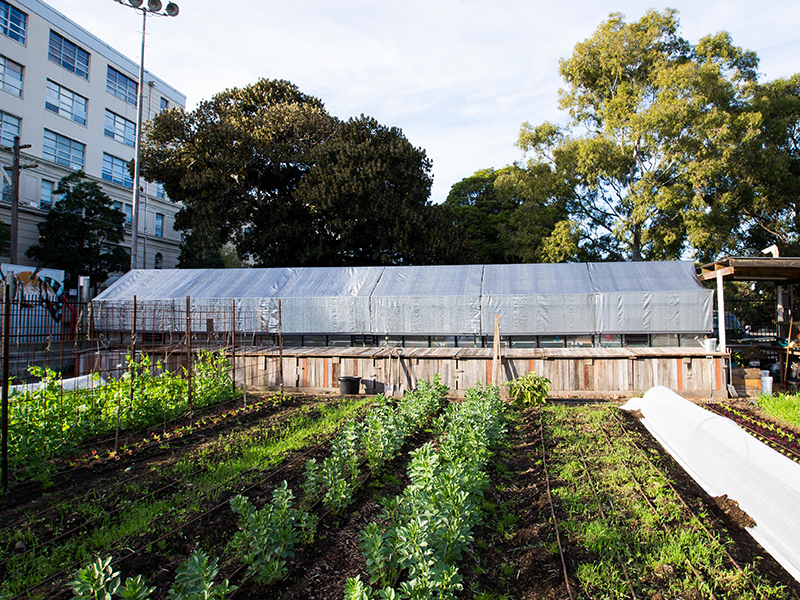 Opened in June 2016, at Camperdown Commons, the farm has become a community hub where you can come and visit the productive ecological farm, pick up some super-local, chemical-free produce, get your hands dirty volunteering, take part in our composting and food forest programs, attend a range of workshops, events, and yoga classes, and bring your school, corporate or community group for a tour, talk or workshop. 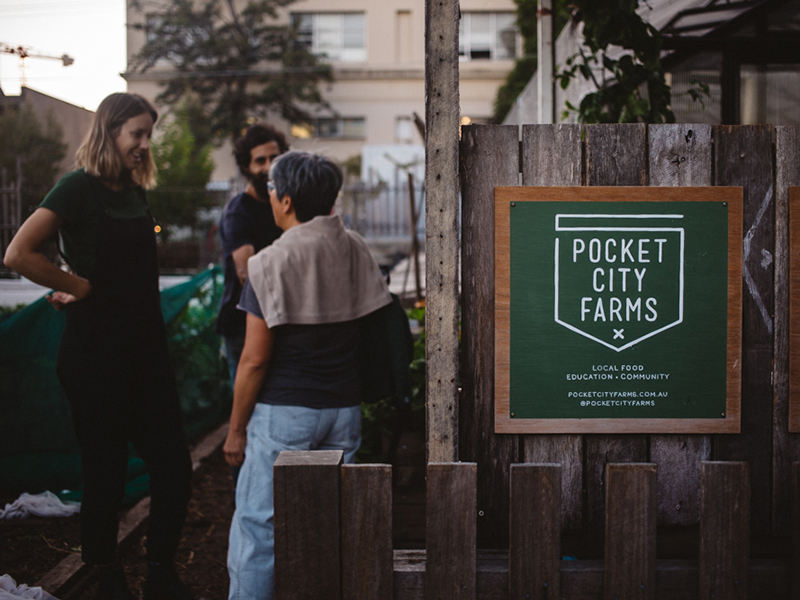 Importantly, the farm is a place to visit, enjoy productive green space in the city, dig your hands in the soil, and learn all about where exactly our food comes from and how it’s grown. The bowling greens have been converted into 1200m2 of market garden using organic practices to grow vegetables, herbs and salad greens. A greenhouse has been established to grow seedlings for the market garden and for sale to the public, and a 16m3 compost unit has been established for a composting program to turn over food scraps from the restaurants and cafes we supply. The street verge of the farm has also been planted out with edibles and will soon grow into a lush 180m2 food forest that will provide free food for the local residents. On our two growing greens of just over 1/4 acre in total we use regenerative and ecological farming methods to grow a range of vegetables, herbs and salads. We take careful consideration to build healthy soil, encourage biodiversity and impact the environment as little as possible. Our soil has been very well tested and approved for safety before we began growing. All produce that we grow is seasonal and grown using organic methods, inspired by permaculture practices. The produce is sold to several local restaurants in the inner west, including acre, Madre, Rolling Penny and Sixpenny among others. We also sell our produce direct to the local community via our online store and weekend farm stall. We make our own compost. We take food waste from the restaurants we supply and convert it into rich compost in this 16m unit, which we then use to top dress our beds. This adds nutrients back into the soil and helps maintain a diverse microbial ecosystem. Our compost is managed through our volunteer Compost Carers community group. More info on this here. This garden, near the common pavilion, is a small-scale replicable and educational edible garden. It includes vegetables, fruit and herbs, bug-friendly and beneficial plants, medicinal plants, a compost bin, worm farm and an insect hotel. To see what's on and to sign up for one of our workshops, head here. Our four hens, Mavis, Myrtle, Minty and Annie, are ex-factory farm hens, rescued and nursed to health by NSW Hen Rescue and adopted by Pocket City Farms. As well as being friendly girls, they serve a very important function on our farm. They feed on the scraps from the farm and in return give us their poo which we add to our compost. This helps us maintain a nutrient-rich closed-loop system. The girls are cared for by us and our Chicken Carers community group. For more info on getting involved with this, send us an email. Want to support and eat from your local farmers? We sell a bumper harvest of veg, fruit and herbs from our farm and other local organic farmers, plus honey from local beekeepers, preserves, tea, beeswax wraps, and other great things to eat, grow and use at our farm stall, at Erskineville Farmers Market, every Saturday 9am-2pm. You can also buy through our online store for pick-up from our farm most days of the week. Eat free from the community food forest. We have planted out our street verge with edibles that will soon grow into a lush 180m2 food forest to provide free food for local residents. This garden is now managed by the volunteer PCF Food Forest Carers community group. For more info on joining the group and taking part in monthly working bees, head here. We grow our own seedlings for use in the farm, and for sale to the local community. Our greenhouse provides a protected and stable environment for new plants to germinate and thrive in. Once the seedlings are strong enough, they are transplanted into our market garden. We have three hives on the farm, which are home to Australian native stingless bees (tetragonula carboaria). A pair of hives sit on the fence near the chicken coop and another single hive hangs in our demo garden. The hives were donated and are cared for by Sydney Native Bees. The bees work hard pollinating the produce on our farm. If you’d like to learn more about native stingless beekeeping, join one of our workshops held in spring and summer - you will find the listings on our events page close to the correct season. On our farm we offer a huge range of ways to get involved, learn and contribute. From volunteering with our farming team or community carer groups, community workshops and events, crop swaps, farm tours, private group workshops and volunteer sessions, school education programs, kids parties, location hire, yoga on the farm, weddings and more. For more info on these click on the links above or send us an email.